Rev. Hyung-jin Moon of the World Peace and Unification Sanctuary surrounded by like-minded folks. 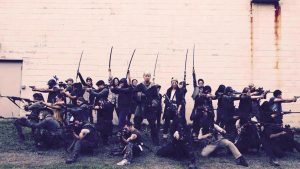 If unable to purchase and legally transport such a “rod of iron” because of laws barring the purchase of such weapons, or other reasons, couples are invited to purchase a $700 gift certificate from a gun store, as evidence of their intent to purchase a “rod of iron” in the future. We’re all about Second Amendment rights here, but that’s not what the phrase means in the Bible. Also: Parkland shooting; Billy Graham called home; media bias; Xbox ghost detector; and the crazed snowboard squirrel at the Winter Olympics. 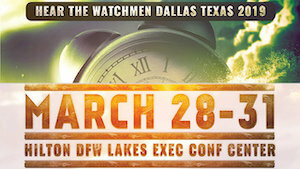 Join us in Dallas March 22-25, 2018 for the Hear the Watchmen Conference featuring L.A. Marzulli, Carl Gallups, Bill Salus, Russ Dizdar, and many others! Save $20 on your registration (and 20% off the HD video feed) by using the promo code GILBERT20 at www.HearTheWatchmen.com.